X-Small - $14.99 Small - $14.99 Medium - $14.99 Large - $14.99 X-Large - $24.99 Only 3 left! 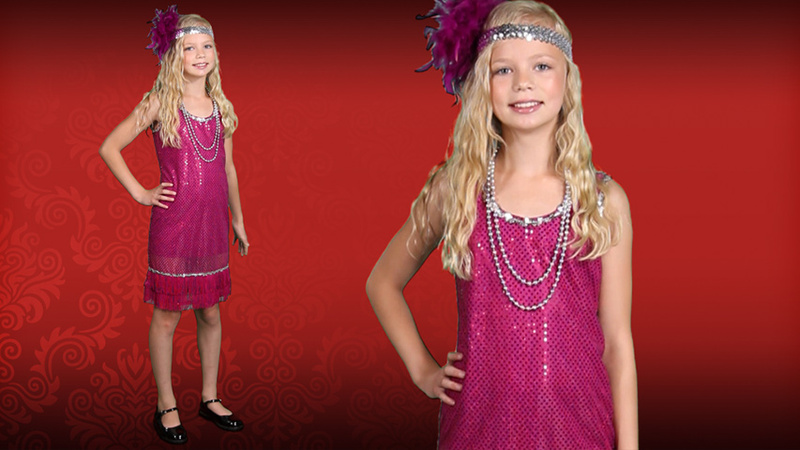 Is your kid into the roaring 20s? Do they love smooth jazz, dancing the Charleston, and finding a glitzy outfit? Or is your kid like ours and has no idea what all of that stuff means? It's alright; we didn't really expect our kids to know what 192’s attire and very old school dance move anyway. It's not like they have gotten a chance to learn about it in school. No, we figure that they saw this dress and went "Ooooh cute" because, honestly, it is pretty cute. It's flashy, sparkly, and even comes with a headpiece. What more could a kid ask for anyway? Well, if your kid is interested and wants to know more about glitzy fashion and dance moves of yesteryear then they will love this child fuchsia sequin and fringe flapper costume.. It's bright pink with sequins all over. There's two rows of fringe at the bottom of the dress, which, if your kid decides to dance (Charleston or otherwise) will swing about in a very pleasing manner (although it is shorter than the fringe shown on the picture). The headband is silver with sequins and pink feathers. Put the whole outfit together and it looks pretty ritzy. And if your kid puts this on they'll look like the bee's knees or the cat's meow. Essentially what we're trying to say is that they'll look pretty cool... even if they're not exactly sure why, quite yet. 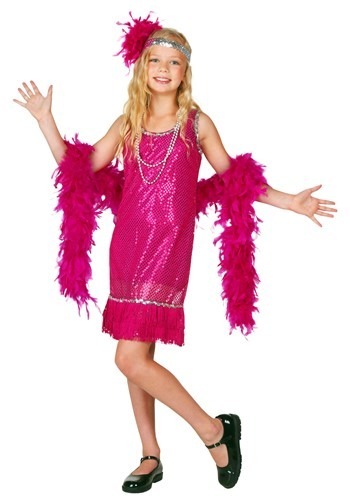 I bought this for my 5 year old daughter for her school blast in the past presentation, her class was doing the roaring 20’s and this costume was just perfect and the price was really great as well. Thank you.